Here is a great tool for training! Orienteering is the skill of finding one's way through a series of checkpoints on an unfamiliar course using a map and a compass. Typically a course is set in a wilderness area and the participants are timed as they complete it. Orienteering challenges both mind and body. 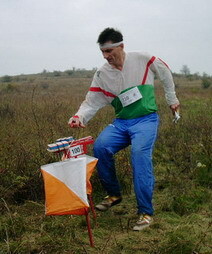 The key to orienteering is the ability to make wise decisions, rather than the ability to run like a deer. Hence the name "The Thinking Sport". Out in the woods, you must make decisions and calculations; reading the map, recognizing the terrain, choosing routes, setting the compass, and sometimes counting paces. 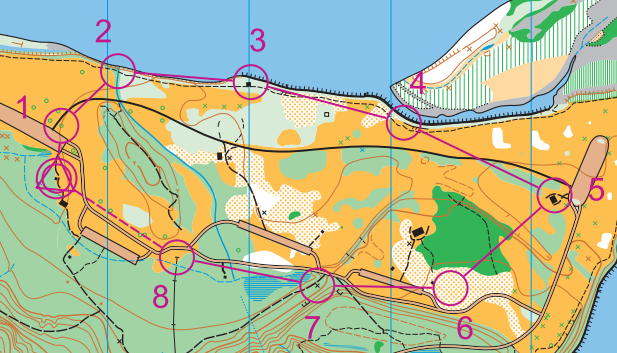 This mental challenge makes orienteering consistently stimulating. The basics can be learned in half an hour, but you can spend a lifetime honing your skills. The equipment is simple and inexpensive, the conditioning necessary is modest, the primary skills easy, the rewards many. For an in-depth introduction to Orienteering you may want to consider Orienteering, by Steve Boga, available at Amazon.com. At an Orienteering Event a specialized, topographic map is used to choose the best route to a series of designated land features (the control points). Each control point has an orange and white control marker, and a distinctive punch which is used to punch a score card. 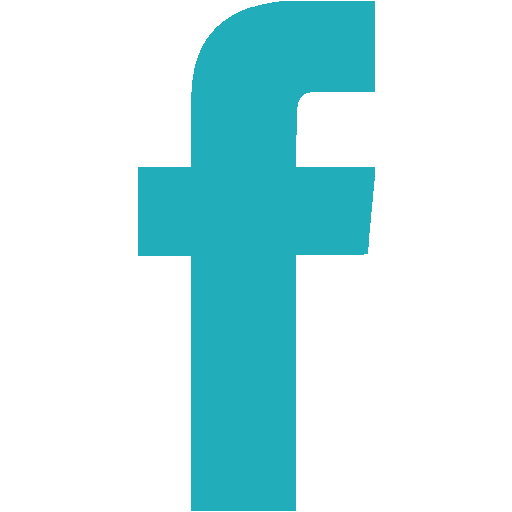 Most events now use an electronic chip timing system which consists of a timing box at each control and a small chip carried by the participant. 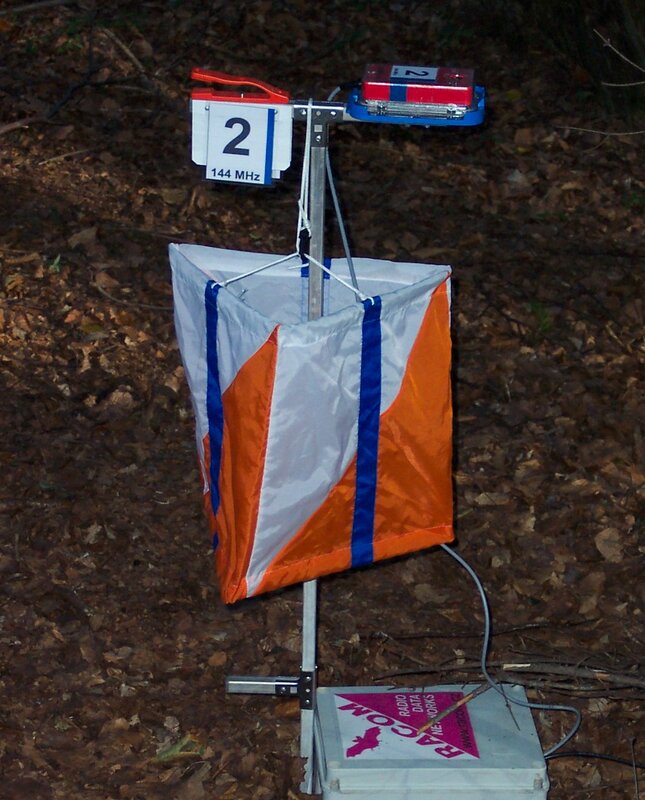 With those controls supplying the reward every few hundred meters, orienteering provides the suspense and excitement of a treasure hunt. The abilities to make decisions and to understand the map and relate it to the surrounding terrain determine how easily the control points are found. What to Wear: In general we tell people to dress for the weather when orienteering. The course for beginners is on the trails, and it is usually adequate to wear whatever is comfortable for hiking. The course for advanced beginners usually goes off the trail no more than 20 yards. 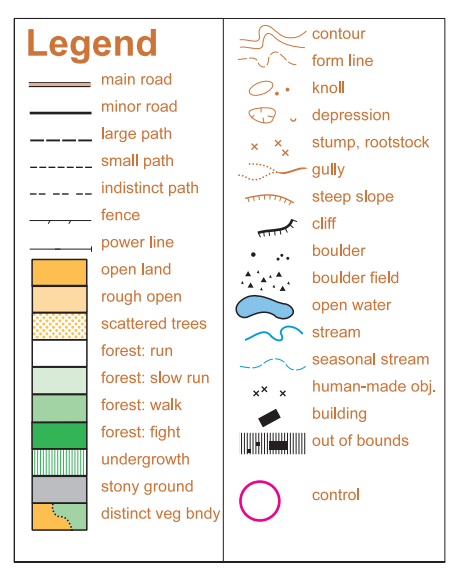 For intermediate and advanced levels, the terrain often is covered by a variety of vegetation and hazards that are unkind to skin: nettles, thorns, poison ivy, and barbed wire. Protection is also needed from various wildlife, including mosquitoes, wood ticks and deer ticks. Therefore, participants on intermediate and advanced courses must wear long pants. We also recommend gaiters and long-sleeve shirts. Since you are certain to be off trail and likely to encounter water your shoes will get muddy and wet. Shoes that dry out quickly are a big plus. Diary of a first-time orienteer! Prelude: A friend of Joe's has been needling him to try Orienteering. He finally caves, not because he chose to go, but because he was preoccupied at the time. While Joe was deep in thought, his friend once again pops the question, "Joe, I'm going orienteering this weekend up at the State Park. You want me to pick you up?" With out hesitation as in shooing a fly Joe simply responds, "Sure". Only later does Joe realize the power of this simple yet under-appreciated word. Following are the thoughts, words and actions of Joe as he reluctantly steps into the unknown, leaving his sense of comfort and security far behind. Deep in the Forest: I am standing in a forest, surrounded by tall hardwoods that are not yet dressed. It is spring, the temperature is cool, but the sun is warming the air. Before me lies a trail. It is well worn with knurled tree roots and small rocks protruding from a sparse layer of seasoned leaf fall. The trail follows the side of the hill; contouring in and out, over earthen waves. Glancing backward I notice that I can no longer see the beginning of the forest. Just a few moments ago I had begun my trek at the edge of a field. There was a break in a line of thick vegetation; I entered eagerly and have been briskly wandering along for on to two minutes. Everything about me seems to look the same. I notice no discerning features to indicate my location. A feeling inside percolates up to my consciousness and I realize that my only connection to home is that trailhead long behind and out of sight. While suppressing a feeling of panic, I stop to gaze at the colorful sheet of paper in my hand. It is a map. Not any ordinary map; But one that shows this forest with this very trail clearly marked. Not yet quite at ease, I wonder 'which line on this map is the trail?' Then I recall the odd man back at the shelter giving some instructions. I fumble through my coat pocket and pull out a simple plastic compass. "The compass tells us which way is north," I recall the man saying. "The map tells us the way to go." The man had lain the compass on his map then did some strange twisting to his left. 'What was it he was doing', I struggle to remember. I lay my compass on my map trying to recreate his example. I notice the red arrow in the compass dial drifting then settling in a direction to my left. 'That must be north', I think to myself, while hoping no one noticed my amazing discovery. I give the map a brief study. Then suddenly, jumping out of the page, is a set of parallel black lines. These I recall are all pointing toward magnetic north. Revelation! But they all seem to be pointing in a different direction than the red compass needle. Devastation! Animal Magnetism: Quickly I grab the compass and twist it, but alas the red needle floats again to my left. I look up again to make sure that no one saw me during my moment of idiocy. I briefly imagine that invisible force that has such a stubborn grasp upon my simple compass. Then I take the map with the compass on top and turn the map with its black parallel lines to match the red needle floating above. Voila, the map is oriented! I am a genius! 'Where's the crowd now?' Just then I catch a glimpse of motion above me and to the right. Swooping from over head and down the hillside sails a large black bird with a red head. 'Wow! Could that be a woodpecker?' I had never seen one before. But now, standing still so long, even nature was moving on with out regard to my threat.Once again, I glance down at the map. It is like a model of the entire park only really small; One 10,000th the size of the real thing to be exact. I am facing the direction that I had set out to go. Therefore, 'I should be able to figure this out', I think to myself. Keeping the map oriented to north I notice a large yellow area on the map. "Yellow represents the open treeless areas", I recall the man saying. That should be the field that I started from. I see a heavy brown line along side the Field. That should be the road and parking area. I picture my car, reduced in size, on the map, in its tiny little spot. At the edge of the field, in the farthest corner from my body, as I hold the map, I notice a black dashed line commencing and meandering through the remainder of the map. It looks like a long segmented snake. That must be the trail! I gaze and wonder where on that black dashed line I am currently standing. Unnatural Sounds: Far off to my right, I hear what sounds like a human voice, perhaps a child. But now silence... I stare off through the open forest struggling to see. 'Did I imagine it? No, I heard it.' The sound didn't seem to belong in this place. Then, once again… It is surely two or more children's voices. I continue to stare when suddenly I see motion. Two children with big sticks and some adults follow behind. 'What in the world are they doing down there in the forest', I wonder. They are traipsing through some rough vegetation, or so it seems. And they're getting closer too. I look at them, then down at my map. 'There it is!' I discover a second trail just at the base of the hill. The map shows it coming toward the hill then taking a sharp turn away. I watch silently as the family approaches closer yet. The lead child suddenly turns sharply to the left and marches directly away from where I stand. My mind begins to stir. I look carefully at the map. 'If that is the big bend in the lower trail', I think to myself. 'And they are walking directly away from me, then…' Simple geometry! By imaging that the trail continued up the hill towards me and away from the family of hikers I am able to precisely locate myself on my trail. What's more, If that is where I am, then I am now closer to where I am going than those kids were to me just a moment ago. Seeing Red: Before I started off on my adventure I had meticulously copied a series of little red circles onto my map. Each of these encircled a land feature of some kind. The man had stated, "Be very careful when copying your course. If you circle the wrong feature, you are going to be very angry with yourself later." The first circled feature was a junction. It connected the trail that I am on with a side trail. Looking up, I am surprised that I can't see the junction from where I stand. I Begin to head in that direction at a brisk pace. Walking a round a slight bend in the trail and over a small rise in the hill, I see my first objective; the brightly colored control marker. 'What did that man call it? A bag?' Well this bag wouldn't hold much, for it has no bottom. It reminds me, in a way, more of a Box Kite. It is three-sided, open on the top and bottom, and bears a reddish orange triangle on each side. Being nearly a foot tall and maybe 8" wide I am surprised that I did not see it sooner. It dangles from some kind of metal-stake contraption about two feet off of the ground. As I approach I realize that I am jogging ever so, anxious to arrive at my destination as if I was to receive a prize. It feels good.I see two other objects attached to the metal stake. One is a numbered plate, like an ID card. The other a small punching-device of some kind. I check the ID card. It is marked in bold numerals: 131. Taped to the back of my map is a description sheet. I know it is there because I put it there. It lists each of my 9 destinations. They each have a numerical ID and a short description. The first one on my list is marked "Control 1, 131, Trail Junction". I am delighted. I have found my way to my first control! Now what's this little punch device? It's bright orange and shaped kind of like a small personal stapler. It's firmly mounted to the top of the metal stake just above the bag. I search my coat pocket for the paper card the lady gave me when I registered for this course. The card is divided up into a set of squares, 5/8 inches per side. They are numbered 1 to 24. I slide the card into the "punch", placing block #1 about where a staple would emerge if this punch had staples. I press the punch down firmly and release. 'How cute', I think, as I remove the card and look at the perforated "T" that the punch has left in my bock number one. It kind of reminds me of a very primitive dot matrix display. Well, the "T" doesn't mean any thing to me but it proves I was here. Now what? Self Realization: I hear some rustling from up the hill. Then I see motion. Three, no four doe come bounding into view. They stop, turn their necks and stare at me. For the longest time I stare back, gazing at the beauty of such animals in such a pristine place. Satisfied to move on, they were gone as quickly as they appeared. I collect my thoughts and for the first time, I look at my map and really begin to understand what's going on. I had drawn 9 circles and a triangle on the map. The triangle represented the start of my hike, the picnic shelter in that open field I had left only 5 or so minutes ago. The circles, each enclosing a feature on this map were my destinations. The man that gave the explanation called them controls. That's an odd word, but OK, so was he. I had numbered each of the "controls" and connected them with straight lines. This represented my course for the afternoon. I must find the remaining 8 controls and return alive and safe to the picnic shelter, map, compass, and punch card in hand. I look at the back of the map at the description sheet: "Control 2, 132, Trail and Steam Junction". I look at the circle numbered 2 on my map. Sure enough, the black dashed line crosses a solid blue line a little further ahead and down the hill. The trail takes a circuitous route to my next control. 'Do I dare cut the corner and do a little cross country?' I take off strolling in that direction. No, I am almost jogging. This I am enjoying! See you at the finish!